There are some things that the amateur astronomer should never leave home without. These ten accessories are just such items, and should be in every amateur astronomer's collection, whether they are beginners or masters. This is not a list of accessories that one absolutely needs to buy as a beginner, but rather a list of accessories that one should eventually acquire. One of the most important things on a long night observing is to be comfortable. And you can't be comfortable if your chair or observing position are uncomfortable. Dobsonians have an advantage here over Equatorial mounts, because they don't get into nearly as many contorting positions. I use a Craftsman workbench stool with adjustable height. It works quite well, and is relatively inexpensive. If you want to spend a little more money, and get ultimate astronomical comfort, there are companies that make observing chairs specifically for astronomers. One such company is Stardust chairs. Some of their products can be found here. The Telrad reflex finder is an inidsposable tool in the amateur astronomer's arsenal. If you don't have or don't want GO-TO tracking, and star-hopping is your thing, the Telrad is not only a convenience, it is an essential tool to find deep sky objects and other celestial objects. The Telrad can be made even more useful with the Telrad maps, which show how to use the Telrad's graduated circles as a calibrated angle measurement. Sometimes referred to as an eyepiece case, an equipment case is a good investment to help protect those precious eyepieces. The one pictured above was purchased at Lowe's for $25, and comes with the pull-out foam that you can shape to your items. It even has locks on the latches. A red flashlight is a must for an astronomer. The color red does not harm your night-vision as much as white light does. I bought a small red LED flashlight that goes around your head. Then you don't need any hands to hold your flashlight, and both hands are free to handle that expensive eyepiece. Make sure, if you're going to a star party, that your red flashlight is not too bright. A dull brown color on white paper will do. If your light is too bright, use a red marker or nail polish to dull it down. It should go without saying that you won't be finding anything with your scope if you don't know where it is. Here, the Telrad maps work great, but you'll probably need something more comprehensive, too. Sky and Telescope's Pocket Sky Atlas (pictured above) is a good one. Also, I would recommend (especially for the beginner) Turn Left at Orion, which contains not only information on how to find seasonal objects, but also educational information on what the object is. It also does a great job of showing what each object will look like in small telescopes. Always keep extra batteries on hand for each piece of equipment that needs batteries. So, for example, the Telrad uses 2 AA batteries, and the cooling fan power pack on most GSO Dobsonians uses 8 AA's. So in this case, I would need to keep 10 AA's laying around, because the batteries in the fan pack or Telrad will die when you need them the most. This is part of Murphy's Law. Keeping a log-book can actually help to improve your observing skills. A simple composition notebook will do here. While observing, jot down some notes on what you see, when you see it, where you see it, etc. Also, don't be afraid to try your hand at sketching. Sketching can greatly improve your observational skills, by training your eye to look for detail. A log-book will also help you remember what objects you've found on your Messier checklist or other catalog. Plus, you never know, your observations might be scientifically important some day! Think of a new Shoemaker-Levy 9 named after you! Having a comprehensive eyepiece set is something that most astronomers spend a good deal of money on. A simple rule of thumb, though, is to have at least four or five good eyepieces ranging from low-power wide-field (larger focal length eyepiece) to high-power (smaller focal length eyepiece). There are tons and tons of choices here, and you must tailor these choices to your observing style. For example, if you prefer deep sky objects (DSO's), you will want more wide-field, 2" eyepieces. If you favor planetary and lunar observing, you might want more eyepieces in the higher power end. You can also use a 2x Barlow lens to effectively double the size of your eyepiece collection. 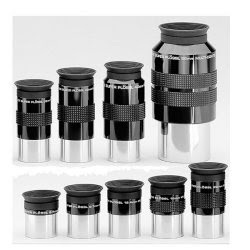 A set of Plossl eyepieces from one of the major vendors can be a good kick-start for the beginning astronomer. This accessory is a must for anyone living in the Midwest or Northern US, or any other areas where winter weather can be brutal. Warm clothing is a must have when observing in winter temperatures, not just to remain comfortable, but to prevent frostbite and hypothermia. The key to staying warm is layering. Wear several layers of warm clothes, and keep most skin covered. You don't want to risk frostbite on exposed skin. Chemical hand-warmers can be picked up at any camping and outdoors outfitter's, such as your local Army-Navy surplus, Cabela's, or Gander Mountain. Wal-Mart even has a small selection in the hunting department. Put hand-warmers in your chest pockets to keep your torso nice and toasty. Some of the best sights in the Northern hemisphere are up in the winter time, so dress accordingly. If you own a Newtonian or Dobsonian scope, collimation is the key to getting good performance from your telescope. Collimation is the precise alignment of all the optics in the telescope. Contrary to your telescope company's opinion, the laser collimator is not a good measure of collimation, especially on fast focal ratio reflectors. The trouble is that the laser collimator is most likely not collimated from the factory. The best alternative is to use a Cheshire eyepiece to line up all the reflections viewed through a peep-hole. This will get the secondary aligned properly. Then you can use the barlowed laser approach to get the primary just right. There are book-loads of information on this subject, more than can be covered here, so expect an article on proper collimation soon. Ah, of course! I agree! A membership in a local astronomy club is a great idea. It really helps to have expert advice on hand whenever you need it! Of course, anyone that wants to add anything else, don't be afraid to preserve it for future readers here! I'd not add anything to your list except a footnote; some of the essential items (such as the observing chair, the collimation tools) can be home-made from plans freely available on the internet, and comprehensive star charts can be downloaded for free. I put together a CD for my astronomy club that had 3 different star atlases and 2 different star-wheel kits in PDF. I'm all up for home-built astro equipment! I'd like to build a 'scope when I've got the time. The Telrad maps I've referred to several times are freely distributed, and one of my favorites! Goodness, I must work on this! 6 word diary. I acknowledge so much how you can keep things straightforward. Goodness knows now and then we need to fixate before we simply backtrack to living basically. so nice tips and trick on here..
Good layout and perfect communication skills. Thanks for sharing a nice piece of info. ماشرکت هم سایت ارائه دهنده خدمات طراحی سایت و خدمات بهینه سازی و سئو و خدمات بازاریابی و تبلیغات اینترنتی است. شما می توانید مشاوره طراحی سایت و مشاوره بهینه سازی و سئو سایت و مشاوره بازاریابی اینترنتی مشورت کنید و با بازدید از بیستر آشنا بشوید. قیمت طراحی سایت و یا قیمت بهینه سازی و سئو سایت و یا قیمت بازاریابی و تبلیغات اینترنتی را با نمونه کارهای هم سایت را ببینید و در هر کدام از طراحی سایت آژانس مسافرتی و طراحی سایت آژانس هوایی و طراحی سایت آژانس هواپیمایی و طراحی سایت مشاوره املاک و طراحی سایت کارخونه و طراحی سایت کارخانه و طراحی سایت خبری و طراحی سایت دانشگاهی و طراحی سایت نمایشگاه ماشین و طراحی پرتال و طراحی سامانه و در ادامه طراحی سایت پزشکی و طراحی سایت دندانپزشکی می باشد سئو و خدمات سئو و طراحی سایت در تهران و طراح سایت ادامه دارد. thanks admin for Incredible site. A great deal of helpful information here. Hi, what a nice post and nodoubt explained beautifuly.Appreciates alot for such a wonderful article and sharing. Keep it up. God bless you. !